More than 11,500 students have been invited to take part in CSUN's 2018 commencement celebration, which start May 12 with Honors Convocation and end with seven ceremonies May 18-21. Photo by Lee Choo. 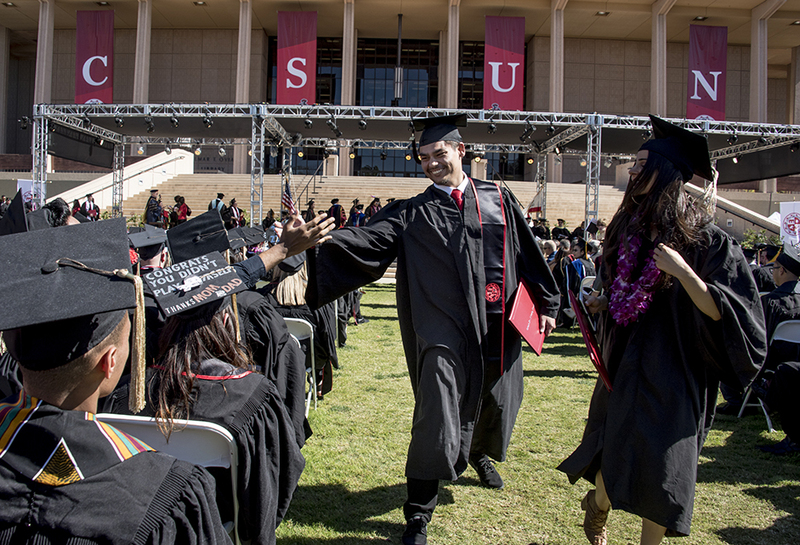 Thousands will be cheering later this month as more than 11,500 graduating students walk across the stage in front of California State University, Northridge’s iconic Delmar T. Oviatt Library as CSUN celebrates its 2018 commencement. An estimated 11,538 — including bachelor’s, master’s and doctoral degree candidates — are eligible to take part in the exercises scheduled to begin the evening of Saturday, May 12, with the university’s Honors Convocation and concluding the evening of Monday, May 21, with the last of CSUN’s seven commencement ceremonies. All eight ceremonies will take place on the lawn in front of the Oviatt Library, located in the heart of the CSUN campus at 18111 Nordhoff St.
“Commencement is the pinnacle of our academic year,” said CSUN President Dianne F. Harrison. “Graduating students and their families and friends gather with the campus community in what is a momentous and joyous occasion. CSUN’s 2018 commencement ceremonies can be watched live online on YouTube at www.youtube.com/CalStateNorthridge or on Facebook at https://www.facebook.com/calstatenorthridge/. CSUN’s commencement celebrations begin at 6 p.m. on Saturday, May 12, with Honors Convocation. This year’s speaker will be alumnus Heather Briggs, vice president and controller for NBC Universal’s domestic home entertainment business. Briggs earned her bachelor’s degree in accounting from CSUN in 1998 and took a job at the respected professional services firm Ernst & Young upon graduation. She spent 13 years at Ernst & Young, working her way up to senior manager. Her duties at the firm included counting the ballots for the Golden Globes. She left Ernst & Young in 2012 to become controller for DreamWorks Animation, where she worked for four years. In 2016, she was named vice president and controller for Universal Pictures Home Entertainment. Briggs has served as an adjunct professor in CSUN’s Department of Accounting, teaching a course on accounting in the entertainment industry. She also serves as a member of the Dean’s Advisory Board for CSUN’s David Nazarian College of Business and Economics. CSUN’s first commencement ceremony — for the graduates of the Mike Curb College of Arts, Media, and Communications — will take place at 6 p.m. on Friday, May 18. An honorary Doctor of Fine Arts will be presented to muralist, educator and CSUN alumna Judy Baca during the ceremony. Baca, who graduated from what was then San Fernando Valley State College in 1969 with a bachelor’s degree in art and a master’s in art from what is now CSUN in 1980, is a world-renowned muralist who took her passion for color, Los Angeles and its youth and turned her paints into a movement. She is the artistic director of the Social and Public Art Resource Center (SPARC) Cesar Chavez Digital Mural Lab at UCLA. One of her best-known works is “The Great Wall of Los Angeles,” which lines a flood-control channel in the East San Fernando Valley. Baca supervised the creation of the mural, the world’s longest at 2,274 feet, by more than 400 at-risk youth and their families. Two years ago, the California Endowment awarded SPARC a grant to preserve and restore the mural, originally painted in 1976. At 8 a.m. on Saturday, May 19, graduates of the David Nazarian College of Business and Economics will take part in CSUN’s second commencement ceremony. At this ceremony, an honorary Doctor of Humane Letters will be presented to philanthropist, industrialist, businessman Younes Nazarian, a leader in the Iranian Jewish community. Nazarian serves as chairman of Nazarian Enterprises, which maintains diverse interests in aerospace, manufacturing and logistics, technology, hospitality and alternative energy. CSUN’s performing arts center, the Younes and Soraya Nazarian Center for the Performing Arts, was named for Nazarian and his wife, internationally recognized sculptor Soraya Sarah Nazarian, after the pair made a transformative gift to support the center. The Nazarians moved to the United States in 1979 with their four children, fleeing the religiously targeted violence and demonstrations that led up to the Iranian Revolution in 1979. Drawing on the entrepreneurial acumen he had in Iran — where he helped establish one of the largest import/export companies of construction machinery and equipment in the region, Nazarian, soon after his arrival in the U.S., became co-owner of Stadco, a precision products manufacturer of specialty parts in the aerospace industry. He was an early investor and served on the board of directors of Qualcomm. CSUN’s third commencement ceremony — for the graduates of the College of Engineering and Computer Science and the College of Science and Mathematics — will take place at 6 p.m. on May 19. At 8 a.m. on Sunday, May 20, the graduates of the Departments of Africana Studies, Criminology and Justice Studies, History, Political Science, Public Administration, Social Work, Sociology, and Urban Studies and Planning in the College of Social and Behavioral Sciences will take part in CSUN’s fourth ceremony. CSUN’s fifth ceremony will take place at 6 p.m. on May 20 for the graduates of the Michael D. Eisner College of Education and the Departments of Anthropology, Geography and Psychology in the College of Social and Behavioral Sciences. At 8 a.m. on Monday, May 21, the graduates of the College of Humanities and the Departments of Child and Adolescent Development; Communication Disorders and Sciences; Environmental and Occupational Health; and Family and Consumer Sciences in the College of Health and Human Development will take part in CSUN’s sixth commencement ceremony. CSUN’s seventh and final commencement ceremony will take place at 6 p.m. on May 21 for the graduates of the Departments of Health Sciences, Kinesiology, Nursing, Physical Therapy, and Recreation and Tourism Management in the College of Health and Human Development. For more information about CSUN’s 2018 Commencement, visit the website http://www.csun.edu/commencement.